We're happy to offer our DC readers the chance to attend a free advance screening of Steven Spielberg's The BFG, based on the classic children's book by Roald Dahl. The film stars Oscar winner Mark Rylance as the "big friendly giant", Ruby Barnhill, Jemaine Clement, Rebecca Hall, and Penelope Wilton. 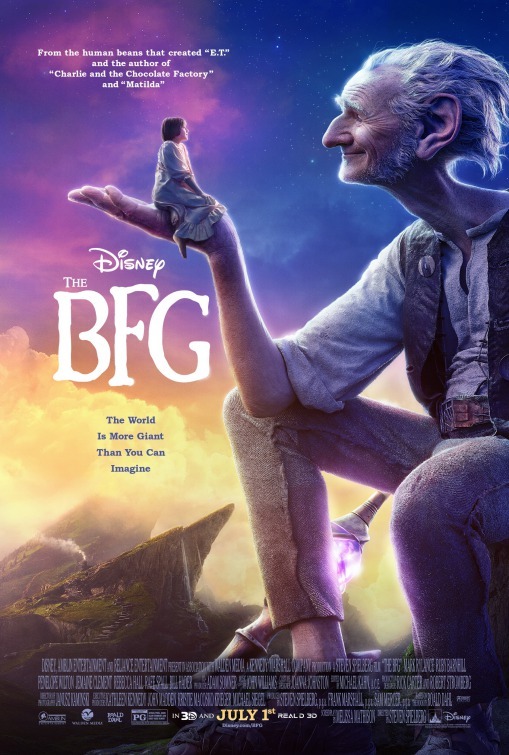 SYNOPSIS: The talents of three of the world’s greatest storytellers – Roald Dahl, Walt Disney and Steven Spielberg –finally unite to bring Dahl’s beloved classic “The BFG” to life. Directed by Spielberg, Disney’s “The BFG” tells the imaginative story of a young girl and the Giant who introduces her to the wonders and perils of Giant Country. The BFG (Mark Rylance), while a giant himself, is a Big Friendly Giant and nothing like the other inhabitants of Giant Country. Standing 24-feet tall with enormous ears and a keen sense of smell, he is endearingly dim-witted and keeps to himself for the most part. Giants like Bloodbottler (Bill Hader) and Fleshlumpeater (Jemaine Clement) on the other hand, are twice as big and at least twice as scary and have been known to eat humans, while the BFG prefers Snozzcumber and Frobscottle. Upon her arrival in Giant Country, Sophie, a precocious 10-year-old girl from London, is initially frightened of the mysterious giant who has brought her to his cave, but soon comes to realize that the BFG is actually quite gentle and charming, and, having never met a giant before, has many questions. The BFG brings Sophie to Dream Country where he collects dreams and sends them to children, teaching her all about the magic and mystery of dreams. Having both been on their own in the world up until now, their affection for one another quickly grows, but Sophie’s presence in Giant Country has attracted the unwanted attention of the other giants, who have become increasingly more bothersome. Sophie and the BFG soon depart for London to see the Queen (Penelope Wilton) and warn her of the precarious giant situation, but they must first convince the Queen and her maid, Mary (Rebecca Hall), that giants do indeed exist. Together, they come up with a plan to get rid of the giants once and for all. The screening takes place on Monday, June 27th at 7:00pm at AMC Mazza Gallerie. If you'd like to attend, enter by completing the Rafflecopter contest form below. Winners will be selected tomorrow, June 24th, and notified by email. Good luck! The BFG opens on July 1st.